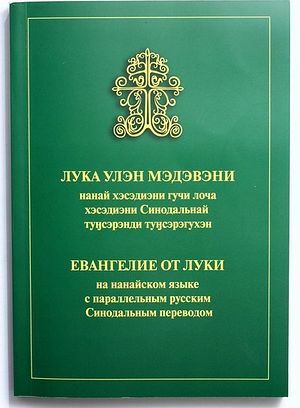 At the request of Metropolitan Ignatius of Khabarovsk and Amur Diocese the Institute for Bible Translation IBT has released a new edition of the Gospel of Luke in Nanai language accompanied by a parallel Russian Synodal translation, reports the IBT website. The previous edition of the Gospel of Luke in Nanai was published in 2002. The new edition of the Bible in the the language of the local natives, who are bilingual,will serve as an educational tool for the clergy; it can become a link in a bilingual environment and a tool for the study of the Nanai language for those of its carriers who have partially lost their native language. The Institute for Bible Translation together with the Khabarovsk and Amur diocese is planning to release an audio version of the translation and to continue to translate the other books of the Scripture into the Nanai language. In the past before the revolution some translations of the Gospels were made with the blessing of St. Innocent (Veniaminov). Among those translations was the Gospel of Matthew in Nanai (Goldsk) made by Fr. Procopius Protodiakonov (1884), which has undeniable value as a monument of scientific and cultural history. It is however not suitable for ordinary readers. Therefore the choice of the Diocese when ordering the reissue of the Gospel in Nanai was made in favor of the Institute for Bible Translation Version.